Treetec is the leading Australian firm in the field of canopy access for scientific research, we have extensive experience in working at height for fauna studies, data collection, introduction of cavities / habitat and nest boxes. We are based in Melbourne Victoria and provide services Australia wide. 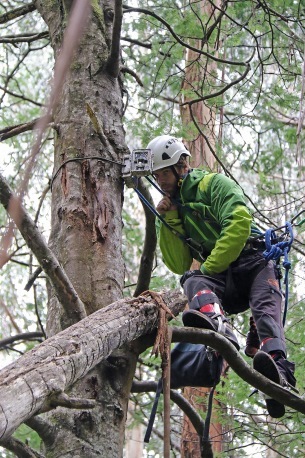 Our team of arborists and climbing ecologists can facilitate any canopy based project. We have extensive experience working with research bodies including DELWP, Parks Victoria and Zoos Victoria. Treetec can provide both the expertise in field based operations and the compliance components to conduct any arboreal based research program. Examples of our work include camera trapping, call-back, various data loggers, monitoring and data collection for both the target species and the related vegetation. Our team can undertake the work on your behalf or alongside your team. Our extensive experience ensures your project will run more smoothly and efficiently, also we are able to provide the OHS / WHS planning and paperwork to ensure workplace compliance is covered in what is an inherently dangerous field of work. Treetec has designed and introduced hundreds of cavities into both dead and living trees as part of research projects, we have learnt a great deal about tree structure and failures, tree reactions to wounding and acceptance or uptake of cavities by the target fauna species. If you are considering a project in this area of canopy access and research we can provide consulting on design, in-field logistical expertise and digital data collection solutions. Treetec provides a range of services around nest boxes from designing a project to intallation and monitoring. We also provide canopy access training suited to community groups and others who are managing nest boxes. Nest boxes can provide valuable habitat for a great range of hollow obligate species however there are some issues around longevity of the box and placement, we'd encourage you to give us a call to discuss the various considerations prior to finalising your methods. Treetec provide specialist solutions for working at heights. Canopy access projects are rarely straightforward. Bringing together the best designs, equipment and people is a challenge and often the location, logistics and safety requirements can derail plans. We are able to consult with you on the requirements of your project and the best way forward. With specialist skills, all the necessary height access equipment and innovative solutions we can help you safely install equipment and personnell within the canopy, be it a short or long term project. We provide specialist training for canopy access work, the training is designed to your specific needs. This is not the standard arboricultural training suited to urban tree management. Tree access for ecological projects and research varies greatly and the training, equipment and safety requirements will be adapted to suit. 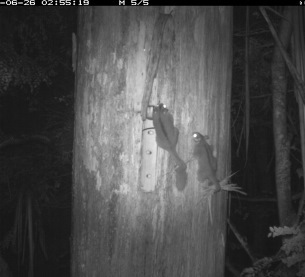 Pair of Leadbeater's Possums (Gymnobelideus leadbeateri) carrying nest material in their tails into an introduced cavity.